I need to start this review by saying that Songs from the Deep Field is the first Darshan Ambient that I have not been immediately smitten with. Typically, from the first track I am all-in with Michael Allison’s work. Albums such as Dream in Blue and Little Things have been on my personal favorites list since the first listen. And while Songs from the Deep Field has grown on through repeat listens, there were a couple of hurdles for me as a listener. Let me get that out of the way before I dig into the fact that there’s plenty of good stuff here. My problem, in brief, lies with the spots where it feels–to me, let’s be clear–like Allison is trying to reach out and add something to the work, to make a bigger and more dramatic sound, only to have it come off feeling like one thing too many has been added. In some cases, it turns out to be an initial jolt. The bravura string pads that open the title track and “Heaven in a Wildflower” hit like a punch of pomp. (You will become well acquainted with this sound by the time you’re done listening. It recurs.) On the title track, although the strings run throughout, the focus is pulled off them by a signature guitar sound, which has a nice, laid-back feel to it, and an overall feel that is, for lack of a better way of putting, more like the Darshan Ambient I’m used to. On “Heaven…” the strings form the basis for what eventually turns into a set of layered and interlaced repeated phrases with a Reich-like quality to them. It takes a few minutes, but my sense that the sound is too artificially dramatic fades as I dig into the way Allison has woven these subsets of sound together. Another partial miss for me is “You Will Never Be Alone.” This one opens as a beautiful work built on piano, long, warm string pads that are a familiar Allison sound, and soft chords. Mid-way through, however, he opts to bring in an almost hymn-like song using an operatic voice sample. It takes the piece to a very different spot, fades out and then comes back once more. Without that element, I like the piece. With it, it just feels interrupted. Having said all that, the majority of Songs… gives me the solid, cinematic, soulful Darshan Ambient I enjoy. Sure, it took me by surprise when “Star Born” launched out of a foggy ambient drift to explode with a techno-esque burst of rhythm, but then when Allison drops in the aforementioned signature guitar sound, it took on a fresh level of cool. And I may not be used to him heading into Deep Forest-style territory, but when it slides into the soft landscape of “Cluster,” it’s very much a win. A classic world-music-inspired feel, drums and all. I reach for the volume and crank this one up. “Micro Life” is a playful samba where floating pads meet that guitar to create a vibe that’s cocktail-cool. On the softer side of things, “Blue Lotus” nudges its way just over the border of ambient by blending feather-light piano with long, misty washes. A truly gorgeous piece of work. That same feel shows up again on “Grey Sea,” adding in a touch of warm melancholy. There’s something of a lullaby quality to it, the piano speaking in a very quiet voice over the chords. I may very well be overthinking the aspects of Songs from the Deep Field that I’m suggesting are iffy. When you get right down to it, it most likely comes down to personal opinions and listening foibles. But one of the things that has always struck me about Darshan Ambient’s work is the incredible level of honesty that’s conveyed. Like this stuff comes straight out of the soul and into the tracks. What I hear in some of the work here just lacks that honesty–to my ear. I always give kudos to artists who move themselves in new directions and challenge themselves. Here, the direction just didn’t ring true for me. But, again, we’re talking about less than half the tracks. 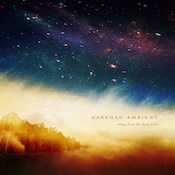 As always, a new Darshan Ambient album is worth checking out. Mileage is certainly going to vary on this one, or at the very least, your mileage may vary from mine. Check it out, form your own opinion.